Headlies: WWE.COM POLL RATES YOSHI TATSU HIGHER THAN JUSHIN LIGER, GREAT MUTA IN GREATEST JAPANESE STARS RANKINGS / MAN FOLLOWS BATISTA INSIDE HIS PIT OF DANGER - WrestleCrap - The Very Worst of Pro Wrestling! Stamford, CT – WWE.com has devoted web space in the past to ranking the top matches, superstars, and moments in wrestling’s storied history. However, for reasons of self-interest and politics, the rankings don’t always jive with common fan sentiment. 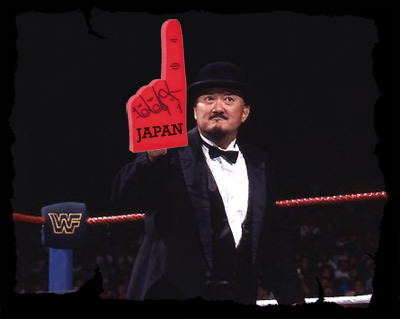 This week, WWE unveiled its “Greatest Japanese Stars in Wrestling History” list, and the results were, well, interesting to say the least. “F—KING BULLSH—!!! !” screamed Dave Meltzer, upon reading the story on his smart phone during a three hour tanning session. The top ten list, in reverse order, went 10)Super Ninja, 9) Jushin Liger, 8) Great Muta, 7) Yokozuna, 6) Kung Fu Naki, 5, Kwang, 4) Taka Michinoku, 3) The Regular Funaki, 2) Yoshi Tatsu, 1) Mr. Fuji. As one would imagine, many fans are angry about this. Indeed, WWE.com has been inundated with hateful response to the list, with some calling it “the most poorly-written, ill-informed garbage since James Caldwell began reviewing episodes of Raw and Impact”. WWE.com, however, stands by the placement of talent on the list. Debate continues feverishly on message boards throughout the web, as Melatio’s statement has only intensified the anger being felt by devoted fans of puroresu. When it was pointed out that Vega is also Puerto Rican, Melatio excused himself for ten minutes, and returned with a well done Photoshop of a Vega publicity shot, now with him wearing a “Hello, I’m: MEXICAN” sticker tag. In a related story, Juan Rivera (who played both Vega and Kwang) is delighted to have been on both lists, and hopes to make the French wrestlers’ list by claiming to have been Sylvain Grenier. Washington, DC – Since June 2005, former WWE Champion David Batista has walked for miles inside his pit of danger, as it was a place where no one followed him. Recently-retired mail clerk Herb Jimrob, 64, of Silver Spring, MD, recently began a nightly walking jaunt to stay fit in his golden years. Walking upwards of eight to ten miles a night, Jimrob claims, makes him feel many years younger. 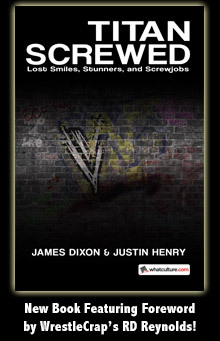 However, a recent dispute between Jimrob and Batista has the potential to turn ugly. It is believed that no man has dared to walk inside the pit of danger since Batista claimed unofficial ownership of it in 2005, and apparently no one has been able to convince him to share access to the pit. Jimrob explained that he merely tried to make peace with Batista, who was having none of the bartering session. That’s when things took a turn for the worse. As for what happened next? Batista was taken to Georgetown University Hospital, where he was diagnosed with a torn quadriceps. Jimrob accompanied Batista to the hospital to make sure his fellow man was okay. Jimrob also declared that he would continue to walk inside the pit of danger, reasoning that, as long as Batista’s injured, it’s a place where no one will follow him.